Just want one or two? You can order here. On a business trip in Cape Town, South Africa I walked by a shop with an astounding array of colors in the window. Blues, greens, pinks, oranges, reds, yellows and browns seemed to explode everywhere I looked. It took me a moment to realize I was looking at an incredible array of candles and not a single piece of art. I purchased a dozen and gave them as hostess gifts. I still find myself hard-pressed to think of a more beautiful, unique, and affordable way to thank the wonderful hosts and hostesses that invite me into their homes for the holiday. 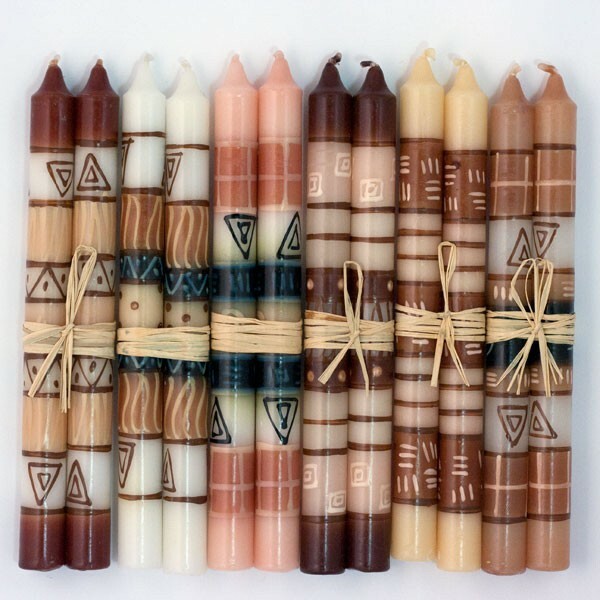 There's a wonderful parallel between the giving of these unique hand-painted candles and the way faces light up when the recipients hold them in their hands. These candles are a great way to bring a genuine piece of African art into your home, and are conversation starters no matter what room you put them in. The colors are inspired by crimson skies, bronze landscapes and gentle buttercup cream and green grasslands of Africa. Additionally. there are collections that have been crafted to go well with specific holidays or events as gifts and decorations. Every candle's unique combinations of stripes, spirals, squiggles and whorls are designed and hand-painted by a small team of artisans, ensuring that no two pairs are exactly alike.